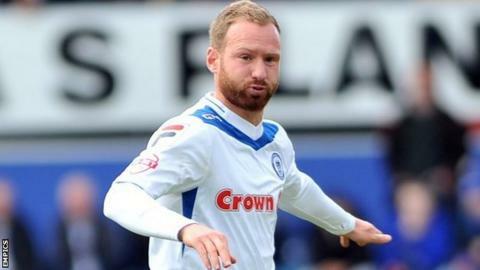 Emergency striker Matt Done scored a hat-trick as Rochdale came from behind to crush Crewe Alexandra and earn a first win of the season. Marcus Haber fired the hosts ahead but Ian Henderson prodded a leveller and teed up Done, whose tap-in made it 2-1. Done ran clear to strike a third but Haber's second, when he glanced home Matt Tootle's cross, made it 3-2. However, Peter Vincenti drove in number four and Done completed his treble with a fine strike after racing clear. "People looked at the starting line-up and thought 'he's gone mad'. "There's got to be a certain bravery or stupidity to what I do. The reward was the result and the performance. "At the end of the game, it felt better than winning promotion because there was a massive risk to picking that side." Match ends, Crewe Alexandra 2, Rochdale 5. Second Half ends, Crewe Alexandra 2, Rochdale 5. Attempt blocked. Matt Tootle (Crewe Alexandra) right footed shot from outside the box is blocked. Jamie Ness (Crewe Alexandra) wins a free kick in the defensive half. Billy Waters (Crewe Alexandra) wins a free kick in the attacking half. Substitution, Rochdale. Stephen Dawson replaces Matt Done. Billy Waters (Crewe Alexandra) wins a free kick in the defensive half. Substitution, Rochdale. Callum Camps replaces Peter Vincenti. Attempt missed. Marcus Haber (Crewe Alexandra) right footed shot from outside the box is too high. Attempt saved. George Ray (Crewe Alexandra) header from the centre of the box is saved in the bottom left corner. Attempt blocked. Chris Atkinson (Crewe Alexandra) right footed shot from outside the box is blocked. Attempt missed. Peter Vincenti (Rochdale) header from the centre of the box is close, but misses to the left. Attempt saved. Vadaine Oliver (Crewe Alexandra) header from the centre of the box is saved in the top right corner. Corner, Crewe Alexandra. Conceded by Conrad Logan. Attempt blocked. Marcus Haber (Crewe Alexandra) header from the centre of the box is blocked. Matt Tootle (Crewe Alexandra) wins a free kick on the right wing. Substitution, Rochdale. Calvin Andrew replaces Bastien Héry. Jamie Ness (Crewe Alexandra) is shown the yellow card. Substitution, Crewe Alexandra. Vadaine Oliver replaces Lee Molyneux. Substitution, Crewe Alexandra. Chris Atkinson replaces Anthony Grant. Goal! Crewe Alexandra 2, Rochdale 5. Matt Done (Rochdale) left footed shot from the centre of the box to the top left corner. Assisted by Ian Henderson. Attempt saved. Matt Done (Rochdale) right footed shot from outside the box is saved in the top centre of the goal. Goal! Crewe Alexandra 2, Rochdale 4. Peter Vincenti (Rochdale) right footed shot from the centre of the box to the centre of the goal. Assisted by Ian Henderson. Attempt missed. Peter Vincenti (Rochdale) right footed shot from the centre of the box is close, but misses to the left. Attempt missed. Ian Henderson (Rochdale) right footed shot from outside the box is close, but misses to the left.